This is our top-of-the-line scooter. It pumps out the power of a motorcycle with the convenience and comfort of a scooter. Offering a fully automatic transmission, an upright riding position, great weather protection, and tons of room for a passenger and gear, the 2008 Yamaha Majesty brakes the traditional scooter mold. High-tech transportation that blurs the boundaries between scooter and motorcycle while setting new standards for utility performance. On the road, the luxurious and sophisticated Majesty is truly a prince. But at the gas pump, you’ll pay…well, like a pauper. Enjoy lots of responsive power while you cruise effortlessly in comfort around the city or on the highway. 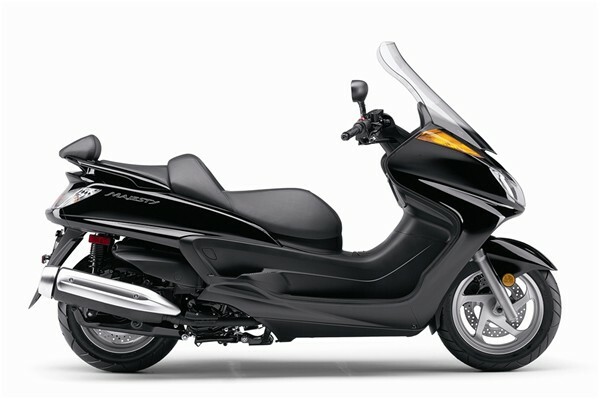 Convenient automatic “gas it and go” transmission and unparalleled weather protection are features of this class-leading “maxi” scooter. With plenty of room for a passenger, plus huge storage space for all of your gear – not to mention the power to push it thanks to a 395cc, 4-valve, 4-stroke engine – the Majesty gives you a ride that’ll always have you grasping for new and better superlatives to describe it. The Majesty is fully highway capable, even with 2 aboard! 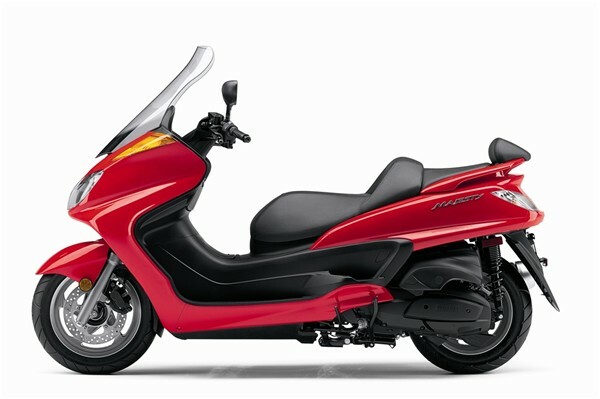 Peppy, 395cc, liquid-cooled, DOHC, 4-valve, 4-stroke engine produces excellent highway capable power and incredible fuel economy. 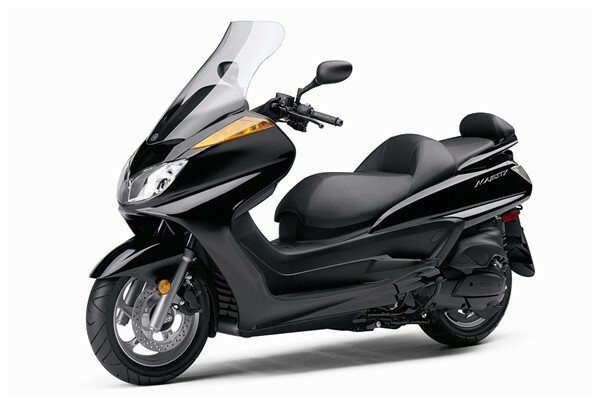 Top speed of the Majesty 400 is over 150 km/hr, making it a great city and highway capable commuter. Liquid cooling maintains consistent engine temperatures even while idling at stoplights or in traffic, for maximum performance and extended engine life. Open deck cylinder design maximizes cooling efficiency. Convenient electric starting with automatic decompression system means fast, reliable starting. Automatic cam chain tensioner reduces both maintenance chores and mechanical engine noise. Specially designed crankshaft utilizes plain bearings to reduce mechanical noise. Single axis engine counterbalancer minimizes vibration to maximize rider and passenger comfort. This is one smooth running scoot. 4-valve cylinder head design provides optimum breathing efficiency for great engine performance. Highway speeds are easily obtainable with this powerful engine. Suction piston-type throttle body fuel injection provides crisp, clean throttle response with excellent fuel economy and reduced exhaust emissions. The system also features a throttle position sensor (T.P.S.) that provides information to the ECU to provide the most accurate ignition timing possible for maximum performance at all rpms. Special idle speed control means there is no need to adjust the idle… a special motor regulates idle speed. The F.I. system uses a single fuel injector with 12 spray holes for excellent fuel atomization and more complete combustion. The injector is located downstream of the throttle body in the intake manifold. Electric fuel pump is mounted inside the fuel tank to provide consistent flow of fuel. Rear-mounted radiator is assisted by an electric fan to maintain consistent engine temperatures even while idling in stop-and-go traffic. Dual air box with dual air filters provides maximum performance and excellent air filtering qualities to extend engine life. Fully automatic V-belt transmission ensures easy, twist-the-throttle-and-go operation. Maintenance-free digital TCI ignition system provides a precise, high-voltage spark for seamless engine performance, sure starts and excellent reliability. Air Induction System (A.I.S.) reduces exhaust emissions for a very clean, environmentally friendly engine. The A.I.S. system reduces hydrocarbons and carbon monoxide emissions by injecting fresh air into the exhaust port to completely burn any unburned gases in the exhaust. This new design engine easily meets the new EU-2 European emission standards. Environmentally muffler not only produces a quiet exhaust note but also features a catalytic converter that reduces harmful hydrocarbons and nitrous oxide exhaust emissions. Final drive is via a clean, quiet, double-cog V-belt. Open, step-through, backbone-style, aluminum and steel frame design allows fast, easy mounting and dismounting. The upper portion of the frame (rear section) utilizes Yamaha’s controlled filling die-cast technology for great strength with light weight. Trailing axle 41mm hydraulic front fork with 120mm (4.7″) of wheel travel delivers good bump-absorbing performance and great rider and passenger comfort. Dual shock rear suspension features 104mm (4.1″) of wheel travel while providing a plush, comfortable ride. 267mm front disc brake with twin piston caliper provides excellent stopping power. 267mm rear disc with single piston caliper provides strong, reliable stopping power. Special design parking brake provides additional confidence when parking the Majesty on sloped ground. 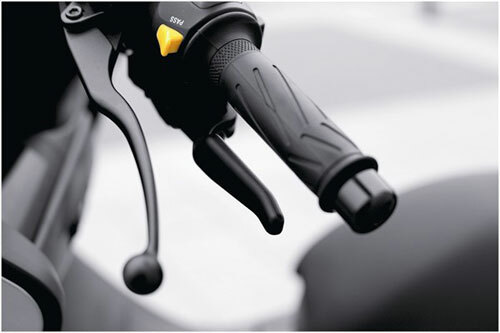 A convenient handlebar-mounted lever activates the rear brake to prevent the unit from moving. The lever is designed to interfere with the left handlebar to prevent the unit from being ridden with the park brake activated. Rugged, cast aluminum, “mag style” (5-spoke) wheels are fitted with tubeless tires. Front wheel size is MT3.00X14 (5-spoke) with 120/80×14 tubeless tire and rear wheel size is MT4.00×13 (6-spoke) fitted with a 150/70×13 tubeless tire. Roomy, 2-person seat ensures excellent comfort. The rider portion of the seat features a back support for even more comfort. 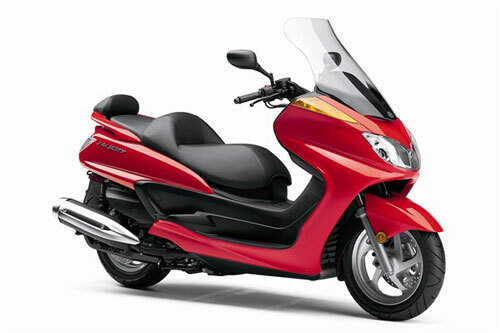 The rider position can be adjusted forward or backward to add or reduce leg room. 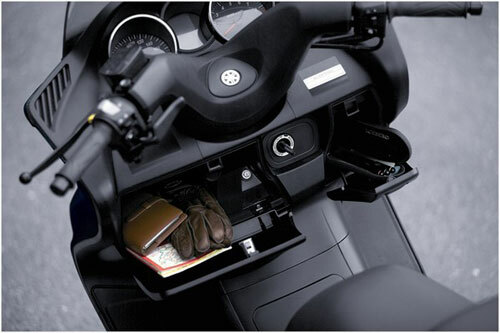 Huge, 60-litre, locking underseat storage compartment can easily hold two (2) full-face helmets. A vanity light is provided in the rear section of the trunk for added convenience. Additional storage can also be found in the front area of the rider cockpit. There is one larger lockable compartment and one smaller non-lockable compartment. Specially designed windshield with laminar flow venting (this vent helps reduce the vacuum effect common with many windshield designs) provides excellent wind and weather protection. Dual 60/55-watt halogen headlights provide a bright beam of light as well as that sleek, cat-eye image. Stylish front apron and floorboards provide excellent splash and wind protection and highlights the Majesty’s functional side. Instrumentation includes analog tachometer and speedometer with digital odometer, dual tripmeters, fuel tripmeter, fuel gauge, outside air temperature and coolant temperature. The instrumentation also includes a V-belt wear indicator light and an oil change indicator light. Convenient passenger grab rail is integrated into the rear bodywork. Side stand safety lock-out switch prevents unit from being ridden when side stand is down. 3-in-1 main ignition switch combines the ignition, fork lock and underseat storage compartment lock into one convenient switch. Locking fuel cap is hidden by special-access panel located near the operator’s feet. Stylish heat shield on muffler protects rider and passenger from hot components.